NOTE: This material appeared originally in the Proceedings of the 10th Annual Oktober Gartenfest, sponsored jointly by Texas Cooperative Extension and The University of Texas Center for American History (Dr. William C. Welch, Committee Chairman) Winedale, Texas, 2003. Everywhere you turn these days, someone is talking about drought and water restrictions. That's not surprising when, according to the Climate Monitoring Branch of the National Climatic Data Center in Asheville, North Carolina, slightly more than 50 percent of the contiguous United States by area suffered moderate to extreme drought conditions last summer. In Aurora, Colorado, where reservoirs are already almost three-quarters empty, a complete ban on planting annuals, vegetables and new lawns has been imposed, at least until the end of this year. In St. Petersburg, Florida, residents are permitted to water their gardens only once a week - on a specific day, during designated hours. Other cities, including Albuquerque, New Mexico, Las Vegas, Nevada, Santa Rosa, California, and Austin, Texas are offering incentive programs for waterwise landscaping, including a variety of rebates for elimination of lawns and/or installation of low water use plants and planting schemes. Given the need for water conservation, today's gardeners - no matter where they live - must evaluate and devise appropriate design and planting strategies. When I arrived in Austin, Texas, several years ago, I made the decision to be actively waterwise. I was coming from England, which you might think has all the water it needs. Some areas do, but I had gardened in Essex, the driest county in England, where the renowned British plantswoman Beth Chatto has her nursery and display gardens. When Chatto converted a large gravel-topped parking area to a dry garden, she set the standard for waterwise gardening - at least in Europe. But her experience has much to teach us. One lesson I learned was to alter my expectations of the flower-filled border. The Chatto dry garden has no supplemental watering systems and can consequently look pretty bedraggled by midsummer. But by selecting plants for their mutual compatibility and xeric nature - their ability to survive prolonged periods of drought - and by following a program of judicious grooming and cutting back, the garden comes through its midsummer, drought-induced dormancy, springing back into life with the first early autumn rains. This routine has translated well to my central Texas garden, and the basic techniques of converting a water-thirsty, chemically maintained lawn to a waterwise landscape are appropriate no matter where you garden. Waterwise success depends upon suiting plants to both the site and each other, thereby creating self-sustaining plant communities. Many waterwise programs promote the use of native plants, and provide lists and cultural information to assist gardeners in the selection. But the plant palette can be extended to include adapted exotics, particularly perennials and ephemerals, to add a layer of form, color, and contrast to the garden picture. One of the best guides I know to aid in the selection of drought-tolerant subjects is Perennials and their Garden Habitats by Richard Hansen and Friedrich Stahl, the published findings of research by these two German plantsmen conducted during the last half of the 20th century. The book lists plants for a comprehensive range of cultural habitats, from damp shade to dry shade; wetland, steppe and rock garden and so on. As the authors note in their introduction: "...many perennials have a wide tolerance and it may be possible to use species from two or more different habitats together in a single planting...the trick is to arrange small groups of associated species within a unified background." This principle can be applied to a "water zoning" scheme recommended in an irrigation guide produced by the City of Albuquerque. In this plan, the "oasis zone" is the planting area immediately surrounding the house where the most water-dependent plants are located. Moving out into the landscape, the next planting area is the "transitional zone," where plants that are moderately drought tolerant find a home. The final zone, at the garden perimeter, is "xeric," for dependably drought-resistant plants. This scheme can be adapted to any region, and the one that I followed when designing my Texas Garden. I wanted a mix of native and adapted exotic plants, which meant that in addition to water-zoning, I also had to identify pre-existing microclimates. I pinpointed areas of dry shade and moist shade; areas where the soil was heavier and better suited to rose-growing; and free-draining, full-sun areas where herbs and Mediterranean perennials would be happiest. Remove existing turf by solarization or the use of translocating herbicides such as those containing glyphosate. In arid climates, let drought do the work for you. Dig the site over by hand, or use a tiller if you must. Remove any perennial weed roots and incorporate well-rotted compost as deeply as you can: a three-inch blanket of compost dug in to the top eight inches is a good guide, but add more if possible, especially on sandy soils. On heavy clay soils, add gravel or decomposed granite to the compost, which will improve the texture of the soil and help to prevent the damaging cycle of baking and cracking. I cannot recommend too strongly that you make your own compost from yard waste. An annual top-dressing in spring, lightly worked into the top few inches conditions the soil, introduces beneficial organisms that assist root growth and plant vigor, and encourages earthworm populations, which further condition the soil, enhancing its water-holding capacity. Parts of a waterwise garden, particularly the oasis zone, will need supplemental watering from time to time. Soaker hoses and rain barrels help make the most of your irrigation efforts. A soaker hose is porous all along its length, emitting water directly into the soil around the plants, so little evaporates. Position rain barrels under gutter downspouts to use for emergency watering during prolonged drought and periods of water restriction. Water on a still day in early evening or early in the morning to give plants a chance to absorb the water: nothing makes less sense than watering at midday. Rather than watering a little each day, water thoroughly once or twice a week: this way water percolates deeply into the soil, encouraging the plants to root deeply into the soil. Remember, deeply rooted plants withstand dry spells better than plants that are shallowly rooted. Covering bare soil around and between plants with a blanket of organic material conserves soil moisture, keeps root systems cool, and suppresses weeds. My personal favorite is coarsely ground wood chips because they do not form a tight mat, as some commercial shredded mulches do. In the Southwest, where plants are adapted to soils that contain little organic matter, mulches like pebbles or rock grit make sense. Like their organic counterparts, inorganic mulches help prevent weeds, moderate soil temperature, and reduce surface evaporation. Spread mulch in spring or fall when the soil is moist, taking care not to pile it up against the plants because this encourages rot. Dry shade has always had the reputation as the most challenging area for garden-making. If you have dry shade, experiment to find out what will survive there. Cyclamen species, including spring-blooming C. coum (USDA Zone 5-9, AHS Zone 9-5) and autumn-blooming C. hederifolium (Zones 7-9, 9-7) can form self-seeded ground-covering blankets of attractive heart-shaped foliage decorated with softly scented rose-pink flowers. The latter species does well in central Texas gardens. Plants with fleshy root systems seem best able to withstand arid conditions. Winter and spring rains help hellebores such as Helleborus niger (Zones 4-9, 9-1) and Lenten rose (H. x hybridus, Zones 6-9, 9-6) establish a foothold in dry shade, enabling them to survive summer drought. Another tough plant is lilyturf (Liriope muscari, Zones 6-10, 12-1), which makes dense clumps of straplike foliage with white to mauve flower spikes in early summer. The central area of my back garden lies in full sun and is occupied by a square terrace of native limestone slabs encircling a tranquil area of drought-resistant buffalo grass (Buchloe dactyloides, Zones 3-11, 12-2). The circle is circumscribed in limestone blocks. A steppingstone path leads from the house to the terrace. The beds on either side of this path are planted with a mix of creeping thyme and dianthus cultivars, silver-leafed herbal plants like curry plant (Helichrysum italicum subsp. Serotinum, (Zones 7-11, 12-2), Santolina pinnata subsp. neapolitana (Zones 9-11, 12-9), Artemisia 'Canescens' (Zones 4-8, 8-1), and Mediterranean herbs such as rosemary, Greek oregano, and marjoram. The flower spikes and strappy foliage from a collection of bearded iris cultivars give height and contrast to the planting, which is otherwise a patchwork blanket of silver gray and dark green foliage. Although this a a full-sun area, the ground covering plants supplement the mulch, and the beds are watered regularly to keep their oasislike freshness; after all, this is the entrance to the garden. Nearby, in a shady corner against the house foundations, the soil is cool. This area does not drain quickly after rain and has been turned into an artificial "dry stream bed" by the addition of plenty of smooth river gravel and large smooth boulders - an attractive contrast to the buffalo grass circle. The stones make an effective weed-smothering, moisture-retaining mulch. It is slowly being colonized by a mix of ferns, including southern maidenhair fern (Adiantum capillus-veneris, Zones 8-11, 12-8), lady fern (Athyrium filix-femina, Zones 4-9, 9-1), and its recently introduced sport, 'Lady in Red', which has soft apple-green foliage and ruby red stems. Japanese painted fern (Athyrium nipponicum 'pictum', Zones 5-8, 8-1) makes a silvery splash in the shadows. Beyond these small formal areas nearest the house, the garden devolves into the transitional water zone and a wilder mix of plants chosen for their good foliage, as limited water is not conducive to lavish flowering. A "short-short list" of the best would include feather grasses (Stipa spp. ), which are incredibly durable, and as graceful as their relative, the Mexican feather grass (Nasella tenuissima, Zones 7-11, 12-7). Shrublike Jerusalem sage (Phlomis fruticosa, Zones 8-9, 9-8) and Artemisia 'Powis Castle' (Zones 6-9, 9-6), along with some heritage roses - particularly the hybrid Musk 'Penelope' and 'Georgetown Tea' - are true stalwarts even when parched, as are bamboo muhly (Muhlenbergia dumosa, Zones 8-12, 10-5) and several species of penstemon. Of these last, the Gulf Coast penstemon (Penstemon tenuis, Zones 3-8, 8-1) is doing the best. Various salvias are the backbone of the transitional zone. This useful genus gives scent, flowers, and in some cases, foliage interest, while the loose habit blends with neighboring plants, knitting the planting scheme together. Salvia darcyi (Zones 5-9, 9-5) is a robust sage with lipstick pink flowers and pretty crinkled foliage, good in sun or part shade. S. madrensis (Zones 6-9, 9-5) grows to five feet given the chance, with long spikes of bright yellow flowers. S. guaranitica 'Black Knight' (Zones 7-10, 12-8) is medium height with dark violet-blue flowers and pleasing anise-scented foliage. For a full rundown on salvias, pick up a copy of Betsy Clebsch's The New Book of Salvias. This being a central Texas garden, I have of course planted agaves, yuccas, and other hardy succulents and cacti. Their sculptural forms add another layer of interest and fill the gap between transitional zones and the xeric fringe of the garden. Xeriscape, despite all its trademarking and commercial promotion, has come to mean zero-scape to some gardeners, who understand a xeric landscape as an empty wasteland of sun-baked gravel and hostile cacti. This is part of the reason terms like "waterwise" and "Mediterranean style" have come into use: They represent an effort to make water conserving landscaping more appealing. It's time to move on, stop agonizing over what we call it, and simply garden. By embracing water conserving practices and appropriate plant selection and placement, the reward is an appealing, efficient landscape that accommodates water restrictions with ease and grace. Many botanical gardens, public parks, and regional horticultural organizations promote ecologically friendly gardening and can be good sources of educational material and inspiration. And don't forget to check the Internet to access countless information sites related to xeriscaping and water conservation. 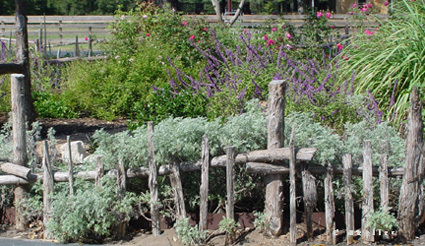 Native Gardens for Dry Climates, by Sally Wasowski with Andy Wasowski. Clarkson Potter Publishers, New York, 1955. Natural by Design: Beauty and Balance in Southwest Gardens by Judith Phillipss. Museum of New Mexico Press, Santa Fe, 1995. Water-Wise Gardening: America's Backyard Revolution by Thomas Christopher. Simon and Schuster, New York, 1994. Note: The article above has been reprinted from the July/August 2003 The American Gardener magazine.